Patients frequently ask me about ‘miracle’ foods they can add to their diets to improve general health. Frankly, I don’t believe in magic potions or pills, but I do think there are a many foods that can be safely incorporated into our diets for general health and disease prevention. One of these foods is apple cider vinegar (ACV). Apple juice has been fermented into vinegar for thousands of years so I consider it a ‘traditional’ food. It was used throughout the ages to detoxify the liver, purify the blood, cleanse the lymph and was commonly prescribed for alleviating coughs and colds. Commonly touted for a long list of health benefits, ACV can be helpful in supporting natural detoxification and improving digestion. Research suggests that it may also help to support natural energy levels, manage blood sugar regulation, lower blood pressure, reduce acid reflux and support weight loss in the context of a healthy diet. These benefits are likely due to some of the compounds found in ACV including acetic acid, potassium, magnesium, probiotics and natural enzymes. These compounds have the ability to support the body and boost immunity without any ugly side effects. ACV also contains polyphenols which have been seen to promote heart health, neurodegenerative diseases, osteoporosis, and diabetes. Vinegar, in general is known to be a natural disinfectant so it’s commonly used by people to clean their homes and bodies. What kind ACV should I buy? Apple cider vinegar is available at most grocery stores, but not all stores carry a raw, unpasteurized version containing “the mother”. It’s imperative that you select and unfiltered, organic and unpasteurized ACV to reap the health benefits. Make sure you read the label to ensure you are buying a high quality version. I commonly buy Bragg’s ACV because it is easy to find and is raw and unpasteurized. How much should I drink/day? Between 1 tsp to 2 tablespoons is recommended for general health by most practitioners. Because ACV is a ‘whole’ food, you don’t have to be precise when measuring it out, unless it’s for a recipe where the vinegar could alter the flavor in a negative way. I encourage people to try subbing out white or balsamic vinegar for ACV in recipes to see if they enjoy it for a variation in taste in flavor. It can also be diluted with water to drink any time of the day. How else can I use ACV? The list of uses for ACV is pretty long depending on your source (and there are many sources out there – some good some not so good). I personally have used it added to water to clean my veggies and sometimes add it to homemade household cleaning products. 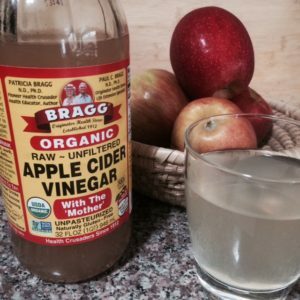 Others have used it to manage acid reflux and heartburn and some swear it can help one lose weight (but I personally think there is more to it than just drinking ACV!). Quite frankly, there are a million uses for ACV that range from a natural deodorant to soothing the common cold and sore throat. Since ACV is not harmful, inexpensive and may actually provide benefit, it’s worth trying them out to see if they work for you! So what’s next… If you are intrigued, I encourage you to try out apple cider vinegar for yourself. I’m all about adding food into the diet that you enjoy — emphasis on ENJOY because that’s a big part of sticking to changes with diet and life in general. Some people are not fond of the vinegary taste while others love it. Don’t worry, if you are not a fan, you will not live a shorter life as a result. It’s just another food to add to your arsenal if you do! In this post, I share a way to safely consume and enjoy ACV.